Should PBoC be blamed for the collapse in gold prices? 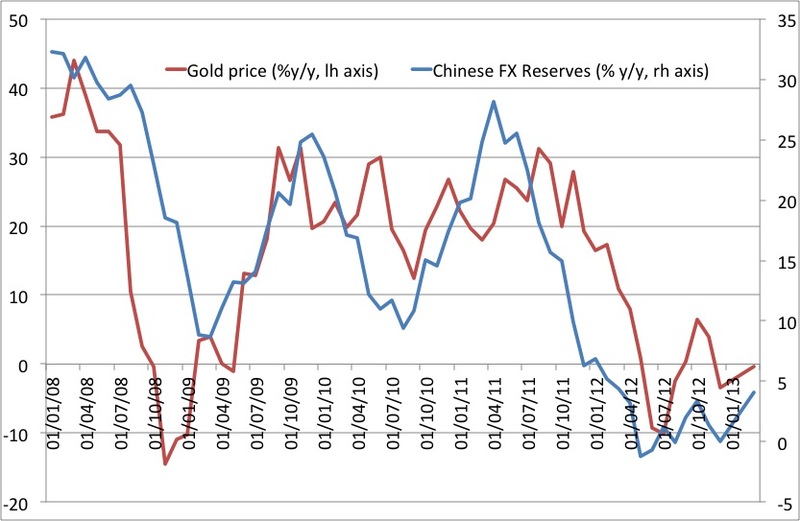 The graph below shows the yearly growth rate of Chinese currency reserves and the yearly change in the gold price. If the Chinese central banks stops intervening in the currency markets to curb the strengthening the yuan then it effectively is monetary tightening – the FX reserve accumulation will slow as will money supply growth. I will leave it to my readers to speculate whether the People Bank’s of China should be blamed for the drop in gold prices. We strangely earlier this week saw the Yen strengthen while gold collapsed — indicating perhaps a dumping of gold into Yen-denominated assets. So, I was suspecting more that the Cyprus firesale to fund the bail-in, in conjunction with a Japanese sell-off, produced this divergence. Not sure otherwise why the Yuan and gold would both drop at the same time where the Chinese would be _causing_ it by not intervening in FX markets. I think there’s natural upward pressure on the Yuan (due to surpluses and long-term manipulation), so when they don’t intervene it will rise — and there’s been downward pressure on gold since the crisis as well. I don’t see the “story” behind the hypothesis you’ve presented. It’s not their weight in the global economy so much as their weight in the gold market. 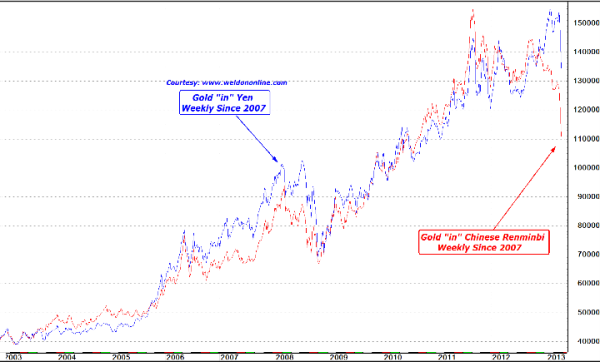 My view was always that gold price is a way to show the level of uncertainty about future outlook, and not so much a reflection of “money printing”, but recently, as hishamh pointed, India and China are heavily involved in the world markets, and thats what makes your chart so interesting and indicative. This is probably a very stupid question – what do you think, could the fall in gold price – being an asset in central bank balance sheet cause readjustment of balance sheet in a way that leads to monetary tightening?